"Professional Experienced Mobile DJ with 36yrs exp"
I have been a DJ since 1976 and in that time I have developed into a high quality professional DJ skilled in choosing the right songs for the crowd in front of me. I use modern professional sound and lighting products for an impressive light show. I always dress for the occasion and aim to arrive in plenty of time to set up and be ready for the required start time. I carry a large selection of music for all ages and from many eras and genres to please mixed crowds. I'm a firm believer on taking requests on the night and I'm also happy to take reasonable playlists in advance too. Required by many venues, DJ Ash has a current PLI policy with Mobile DJ Network in the amount of £10 million. Also required by many venues, DJ Ash has supplied satisfactory evidence of holding current PAT inspections of their equipment dated within the last 12 months. A Method Statement outlining DJ Ash&apos;s Health & Safety procedure for setting up disco equipment has been provided. Why do people choose to book DJ Ash? First to quote and price. "A good selection of music and the DJ interacted well with the dancers a good night"
"We are glad you have a great night "
"Hope I got his name right because he was excellent. Nothing was too much trouble and he was very helpful and freindly. Only problem was he did not have our pre-sent music choices that I had e-mailed to you but he was early enough that we were able to go over them before guests arrived." "Hi i am glad you were happy with our service Kevin"
"Kevin Dj was lovely but the karaoke system didn’t work until 11pm, we had booked from 8pm until 1pm. When it did eventually work we had a great night. There was no interaction from the Dj to our guests. Did send our thoughts to the boss who said he’d looked at everything and couldn’t think what we wanted from him. 60th birthday party, not ruined but could have been a whole lot better." "I think this review is very unjust, we discussed this via email when you were on holiday, and showed you evidence of the 1st karaoke song being played at 1040pm prior to this there were speaches and your guests arriving with the 1st karaoke requested at 1015pm, as we also said in the emails it was very hard for keven to interact with the function was in a pub and people next to the dj desk and the dj was worried if he left the decks the equipment would be tampered with, and as you said there were alot of randoms there, Kevin interacted via the mic rather than going around the pub, you did state in your emails that the music was not old and again we sent you a copy of the nights playlist from his histor that showed 99.9% of the night was songs from the 60's to 80's. the landloard from the pub said it was an exeptional night and have had 2 bookings from the night." "Mark was friendly & funny! All the guests enjoyed the entertainment.. couldn’t recommend enough! Thank you again mark! look forward to more events in the future! " "Thanks for your kind remarks with regards to the party it was a pleasure to do." "DJ Ash was an outstanding DJ, worked the mic really well and kept all the children entertained. Definitely a 5 star outfit and would definitely recommend and book again! Thank you." "When I originally spoke to Mark, I was under the impression he was the guy doing the disco and I took him at his word that all would go well. He told me on the week of the event it would be a different guy but that they were all good DJs. The guy who arrived didn't speak at all and I had to prompt him several times. The initial music played was inappropriate for the event, I had emailed a comprehensive list of tracks to choose from and although he did play some of them and the dance floor was busy at times, I felt I could have hired equipment and done a better job myself. There was no interaction from the DJ at all and the only time he spoke was to announce the buffet was ready. He did play the last 3 songs I asked for so that was the only thing in his favour. He also hassled me about the balance of the payment which had already been paid by bank transfer as agreed with Mark. He wasn't happy about that at all and even phoned me on Sunday wanting prove we had paid the money. Thankfully there were enough great people there that the party was great fun for all but I definitely would not recommend this company to anyone." "Perfect DJ. Played all the songs I wanted and was great with interacting with the guests and getting people to join in. Many people have said how great he is and what a brillant atmosphere he created! Please use him!!! " "Tony from DJ Ash discos did a fantastic job! When he told us it was almost midnight I could believe my ears!!! :) would recommend him to anyone. The music was fabulous old and young had a blast!" "Do got the bride's name wrong twice even after the info being supplied to the company. He said it was a miss comunication from the company as they supplied the wrong info. But was not the end of the world.but would have got a higher rating as it was some ones fault as I supplied the info." "Colin was excellent and as well as providing superb music he kept us all on track through our speaches, Scottish dances and the whole evening. If I have another event I would hope to be able to book him again." "Th DJ Mark was excellent, and everyone had a great time, however, we requested some Scottish Country dancing, which didn't happen. To be honest, we didn't notice this till after the event. I also sent the DJ company a couple of MP3s with recordings of my family's bands, and these weren't played during the evening. We also made out an extensive playlist, and some of the music played on the night weren't on that playlist. To be fair though, I did say to Mark before he started to use his own judgment as to when to play things, but I meant from our playlist. Don't get me wrong, it was a great evening, it was just that a few things were missing that we had asked for." "My DJ thought he was my bouncer, intimated guests, followed teenage boys to smoking hut & toilets and thought he had authority to ban ur bring banded kids back into party_ he was an absolute nutter who I had to remote and on several occasions - definately wouldn't book again- although despite all this night was a great success and everyone had a fab time - just took up to much of my time away from party controlling the DJ I paid for who thought his job was ????? Not doing but righting thr youngsters who are actually fab. " "Good mix of people there DJ catered for them all." "The DJ was excellence can't ask for anything more the music he played was great really made our nite "
"We were given an invoice which did NOT state we had to pay before the arrival of the DJ sonthis eas an issue when they arrived. It only said on the invoice that the money was due on 28/01/17." "Ash made a great contribution to my party, he made everything run very smoothly and made all the difference. The lighting was superb as the quality of the sound equipment superb. Whilst there wasn't a huge number of people up dancing I know for a fact that everyone appreciated the music and his style. Definitely recommend !" "The Lighting was minimal I was expecting https://www.youtube.com/watch?v=mPL3Dtm2VPg&t=31s. Thought I may have not clicked the right pack it was the super deluxe version. anyhow every one had a great time and I just learned that my Friends Scott and Hazel have booked you guys for there wedding and have past on the youtube clips Cheers for a good night Ross"
"OUR DJ ON THE NIGHT WAS EXCELLENT, HE ARRIVED AT THE VENUE IN PLENTY OF TIME AND HAD THE MUSIC PLAYING ON TIME AS REQUESTED FOR MY DAUGHTERS 21ST. MIKE INFORMED ME THAT HE HAD ONLY BEEN GIVEN THE GIG A FEW HOURS BEFORE IT WAS DUE TO START, AS THE DJ THAT WAS SCHEDULED TO PLAY AT OUR PARTY COULD NOT MAKE IT, FOR WHATEVER REASON,,,. THIS IS ONE OF THE MAJOR REASONS FOR BOOKING A LARGE DJ FIRM, THEY HAVE THE SUPPORT WHEN NEEDED, IF FOR WHATEVER REASON THE DJ CANNOT MAKE IT. ON THE NIGHT MIKE WAS AN EXCELLENT DJ, PLAYING A GOOD MIX OF MUSIC AND INTERACTED WELL WITH THE GUESTS. I WOULD DEFINITELY RECOMMEND THE DJ ASH COMPANY AND MIKE THE DJ, THANKS FOR A GREAT. " "The DJ was exceptional interacted with everyone played requests when asked and made my daughters 21st night amazing. Everyone I have spoken to since has said what a great night they had and asked where I got the DJ so good time all round. Thanks "
"My DJ was absolutely superb! They made our night even more special. We couldnt recommend tgem enough. The venue even asked my for their details as they were so impressed. Thanks again"
"Absolutely amazing unfortunately didnt catch his name think it might of been mark he made sure everyone had their taste in music never complained once and was such a lovely well mannered gentleman had a blast so thank you would deffo recommend"
"When i got there the dj was standing saying he didnt know how he was meant to get his equiptment upstairs ... The gentleman i booked with over the phone knew it was upstairs but the giy claimed he didnt. And then 2 people at my party went and helped him carry the rquiptment upstairs. Other than that he was excellent played all the music i asked for!" "Very friendly! Loved how me interacted and spoke to everyone would definitely book him for a party, wedding or any other events"
"As it was kids party I had to ask for song to be stopped as due to bad language to be told that's chart music. It was my child that noticed and it came on 3 times and dj didnt notice.There are radio versions. Music choice would have been more suitable for teenagers. Disappointed as when booked I was assured that the music content would suit age groups. Had to request songs for kids. It seemed that he was unfriendly didn't introduce himself on arrival,set up played music,got paid was easy money. Have phoned to complain. Would never use or recommend"
"Hi, I'm sorry to hear about this problem. We will take this up with the Dj who did your function. All our DJs are told to play only radio edits at all functions!" "the DJ was cheeky to my daughter"
"Hi,thanks for your feedback. We have spoken to the Dj who did your party and reprimanded him. Sorry that this happened." "Would definitely recommend DJ Ash discos, everyone had a great night!" "Mark was very friendly right from arrival. the party was great fun as soon as everyone arrived. He had everyone dancing playing both requests &. What he thought we would all like.. Feedback from all guests was that he was brilliant and had everyone dancing in a fun and enjoyable way including the youngest at 6 to the oldest in their 60's. I will be booking DJ Ash for my next event & definitely recommend"
"Thanks for the feedback we will pass this on to the DJ in questions and if you are looking for something in the future please let us know"
"some of the people who were there were not impressed and at one point (9.30ish) the Vice-Captain actually asked the DJ if he posessed a microphone as he hadn't used it. I specifically asked if they would be Scottish music with it been Hogmanay and they said yes but this did not happen." "Sorry to hear you were unhappy with this and since we had read this reviews the DJ no longer works for us as we have high standards that we expect from all our DJ Ceilidh wold have been a must and we would have expected him to play this." "This company was very easy to deal with- Mark was easy to contact, friendly and helpful. Our DJ on the night (works for Mark) wasn't quite so outgoing, but was friendly and did interact with us (he gave us a demo of his shuffling, which was greatly appreciated!) The music while we ate was great, but I feel later on was a little "dated" for us. While we may have mostly been older than the DJ, as a group of Zumba ladies, we are used to dancing to music from many decades, but predominantly more recent ones! Music from the past couple of years would have gone down great- however this is partly our fault as we should really have requested more earlier on. All in all, a great DJ-would do it again (and may do!)" "Colin was a great DJ and everybody said that they had a great time. Many thanks :-)"
"Excellent DJ provided by DJ Ash for our school PTA Family Disco fundraising event. The equipment was perfect for our venue (and good value for money for our fundraiser). We;ve had lots of very positive feedback re the event. The DJ was very professional and engaged well with the audience (young and old alike). The DJ also kept me right (by pro-actively asking for info so that he could promote our other fundraising activities, which were going on during the evening)." DJ Ash also offers a range of additional party services not directly linked to musical entertainment. 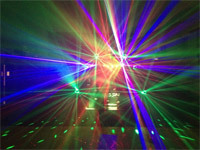 Get FREE no-obligation disco quotes from DJ Ash and other DJs covering your venue. Take 2 minutes to fill in some basic details and we'll do the rest! If you are contacting DJ Ash about an event, it's always a good idea to include the DATE, LOCATION, EVENT TYPE, AGE GROUP and TIMINGS to speed things up!